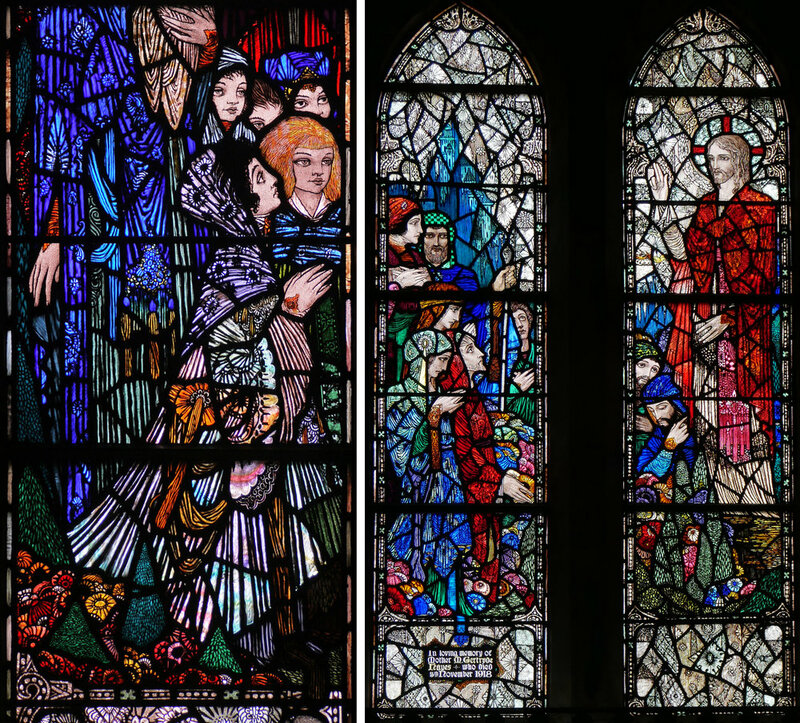 This is a continuation of my Harry Clarke tour, with visits to another three buildings in the south of Ireland. Seeing the windows that I know so well from books reinforces the fact (that I also learnt from books) that stained glass is an architectural art, dependent on its surroundings for the impact it makes. 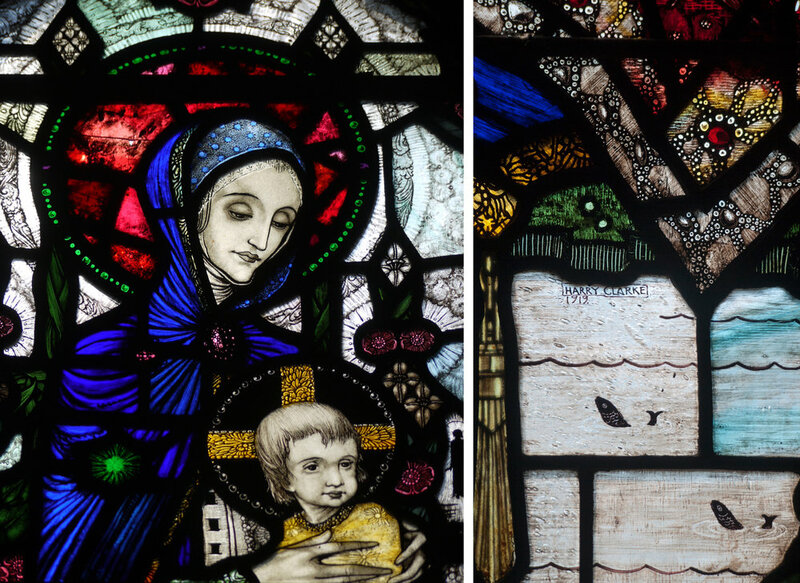 The windows I really wanted to see are in the Honan Chapel of St Finbarr in Cork. 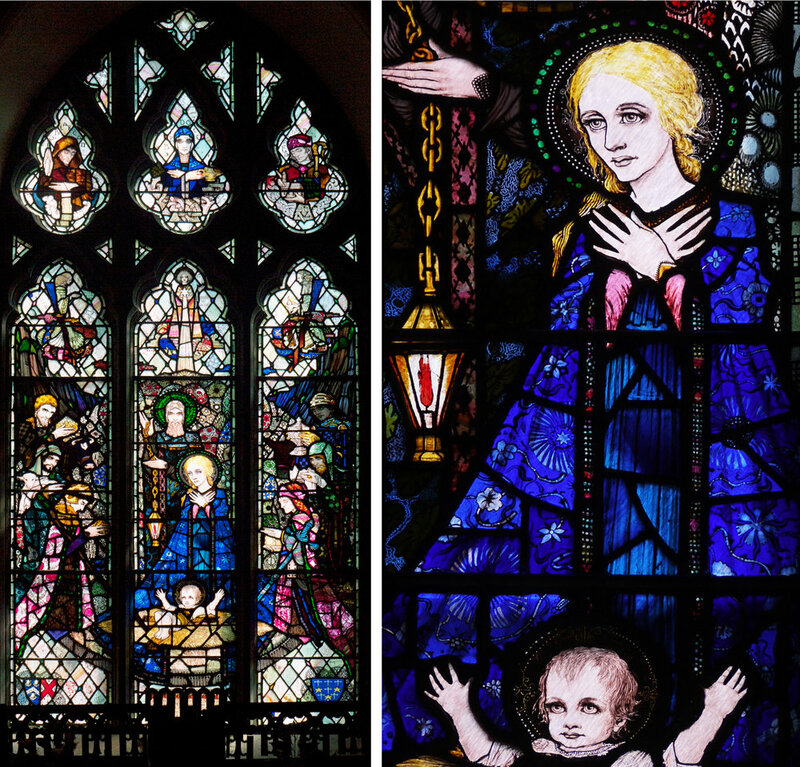 These eleven windows, Clarke's first significant commission at the age of 25, show eleven Irish Saints with small figurative scenes above and below each magnificent, exotic figure. In this chapel, built in the style of the Celtic Art revival from 1915-16, the balance of light was all wrong - overlit inside, overcast outside - so you could hardly see through the windows, apart from the two in the unlit chancel that include the beautiful Our Lady of Sorrows (above right). The windows in the nave, all made in 1916, are set in deep stone niches above eye level, the colours and details are gorgeous and Clarke's windows put the others in the chapel, made by An Tur Gloine (Sarah Purser's studio) at the same time, in the shade. 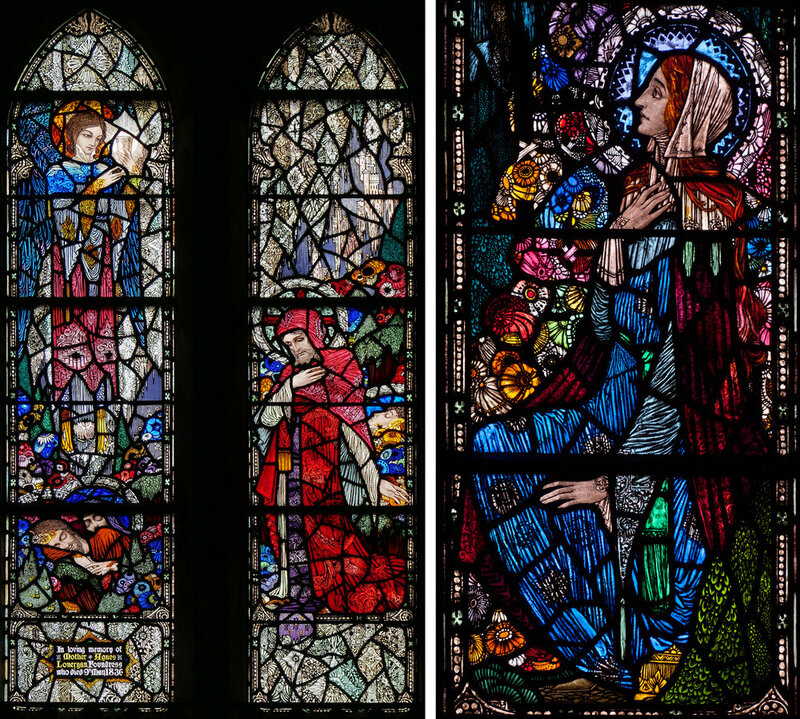 St Gobnait is the most eye-catching figure, see her profile above left, with the red and blue beads advancing from the borders to make a background for her flying bees. The borders and the scenes above and below the other saints are filled with writing, figures, patterns and stories. Wonderful to see a grotesque Judas with frightened pilgrims behind him at the bottom of the St Brendan window (below right) and great to know that the strangeness of these characters didn't stop other churches commissioning work from young Harry. Sometimes it's hard to focus on the beauty of the stained glass when you are confronted with all the other stuff you need in a church. The photo above shows the interior of a small rural church in Duhill, two fantastic Clarke windows and me close to the left hand window, having moved a banner that was hiding the lovely patterned lower section. The morning light was flooding through this window that shows the vision of Bernadette. The two figures are beautiful and glow against a stripy sky with the silhouettes of trees and towers. Zooming in on Mary, I love the way her radiance is surrounded first by rocky crags and hanging flowers, then by a border of bright beads that puts the whole scene into a more interesting craggy shape. Although the other window, with a dramatic scene showing Salome carrying the huge head of St. John the Baptist, is equally good, the balance of light that morning - too much natural light this time inside the church - made it more difficult to read. The tops and bottoms of these two windows are filled with tiny patterns, doodles on pale glass around a bright geometric flower; intricate, abstract panels and borders that really compliment both of the complex figurative scenes. 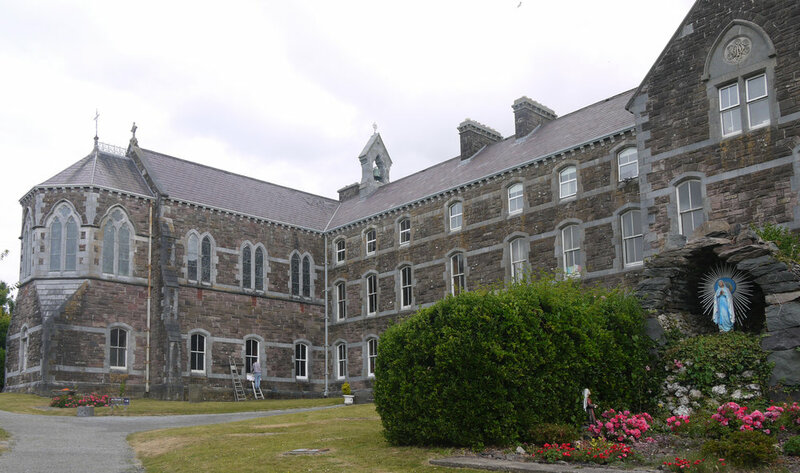 The six pairs of lancets in Dingle are in the first floor chapel of the former Presentation Convent -on the left in the photo above. They were made to his design by Clarke's studio in 1925 and represent the life of Christ. In comparison with HC's early masterpieces in Cork which he painted as well as designed, it is easy to spot some painted passages, particularly the bland heads of Christ, that were executed under his supervision but by other artists in the studio. However, set in the small, narrow space of the beautifully furnished chapel, these windows are overwhelming, rich, detailed and delicate. The clear glass in the borders, tops and bottoms is very effective, and the rest of the backgrounds are filled with flowers, 1920s style in a brilliant colour palette. I love the design of all of these windows, the position of the figures, the groups of heads in profile, the clothes and shoes and the fantasy landscapes in the backgrounds. This is the place that I would recommend for a visit, not only for Harry Clarke, but for the whole of the beautiful Dingle peninsula. 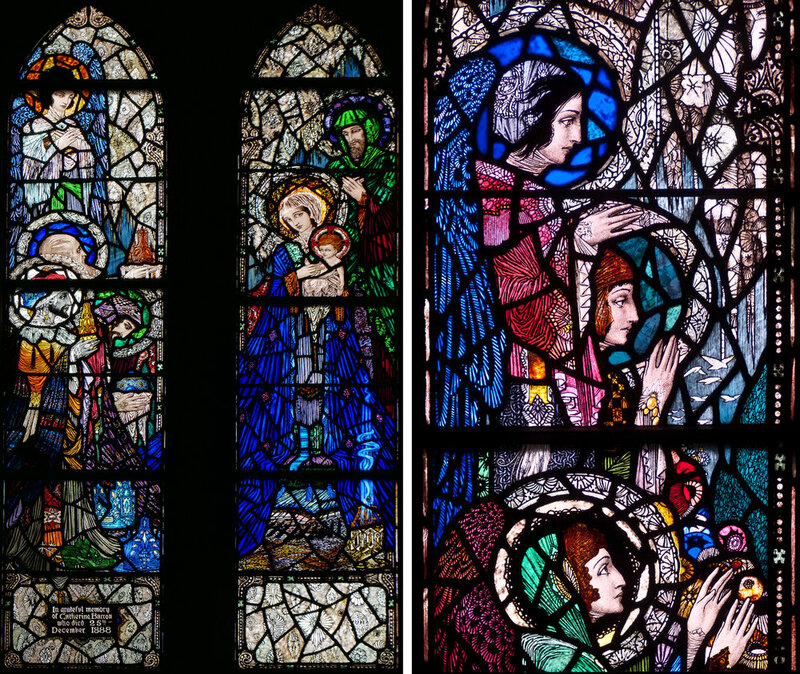 The Harry Clarke window in St. Mary's Church, Sturminster Newton, Dorset is worth going a long way to see. I pored over poor quality illustrations of his work in stained glass catalogues when I was a student but never managed to visit any. 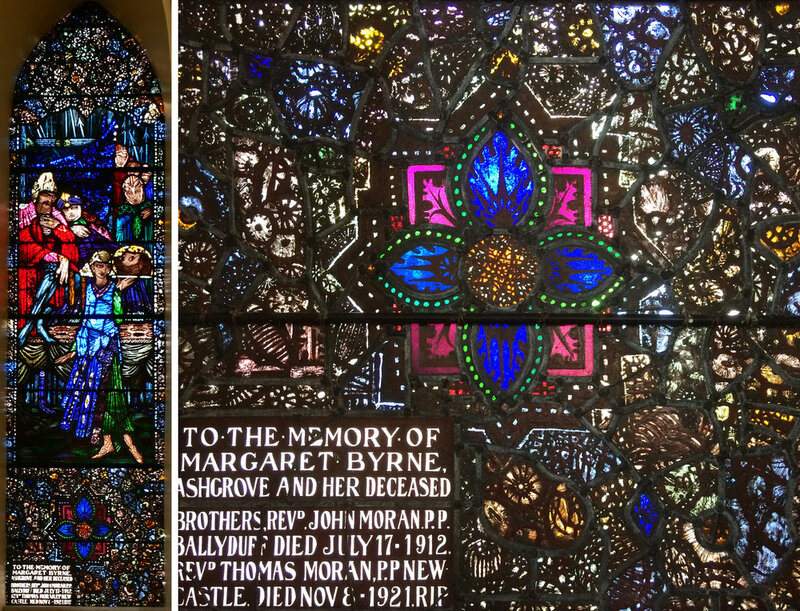 It was worth the wait - better in real life than you could imagine, a reminder of all the best things about stained glass and a thrill to see the signature of my first favourite stained glass artist. To savour the moment that I saw my first Harry Clarke I did a quick sketch of some of the background details. However, the figures interested me as much as the patterns, or maybe the way the figures get their strength from the way they are entwined with the patterns and sharp contemporary details. 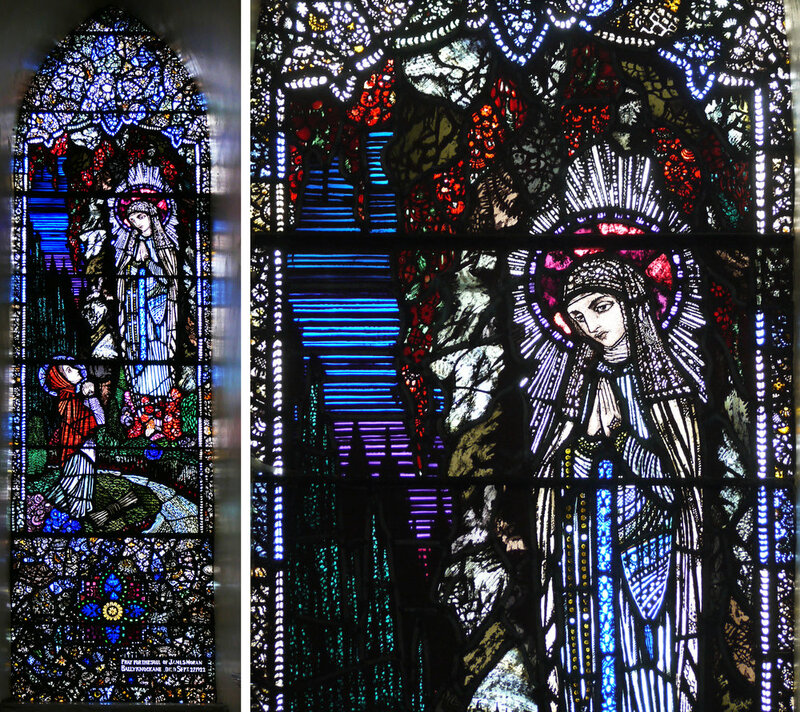 St. Elizabeth is based on a portrait of Roma Spencer-Smith in whose memory this window was commissioned and St. Barbara is based on Harry Clarke's wife, Margaret. The child is a portrait of Roma's son, under a year old when she died in the influenza epidemic of 1918. These figures sent me off to find out more about the combination of people and saints portrayed - I like a portrait that looks you in the eye.